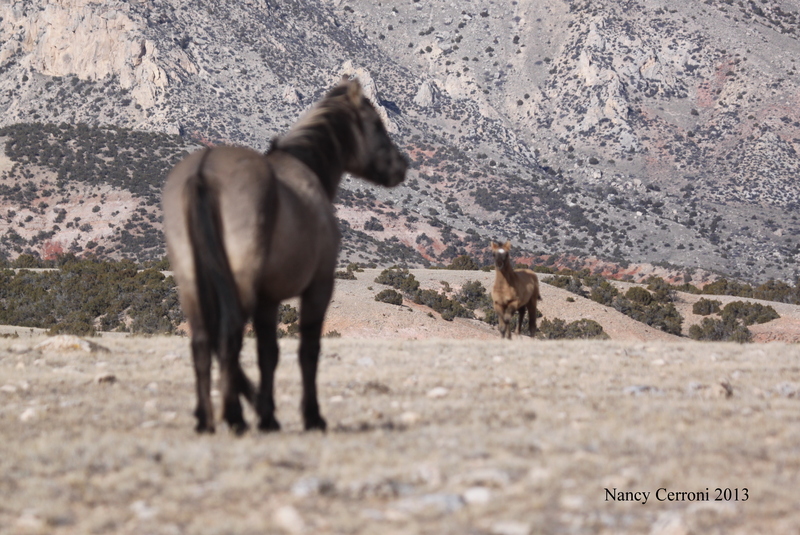 Today I had spent a wonderful day in the Dryhead with Kim Michels and her friend, Bobbie. 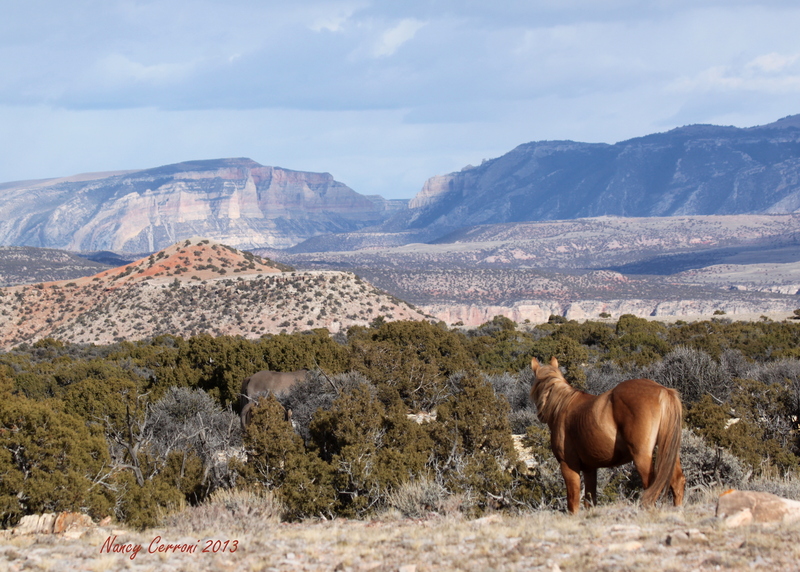 It was a picture perfect day with the amazing scenery of the Canyon area all around us and the big, blue sky above. 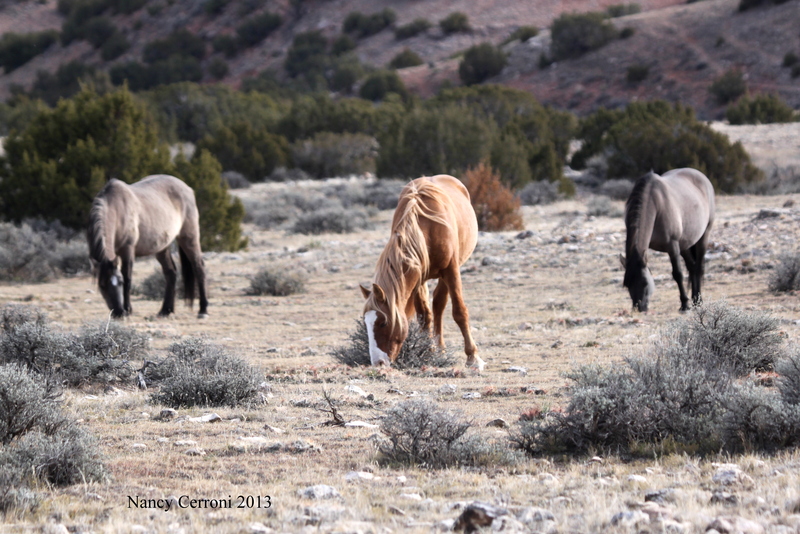 One of my main reasons for the day’s return trip was to see is Seneca and Hightail had returned to Hickok. 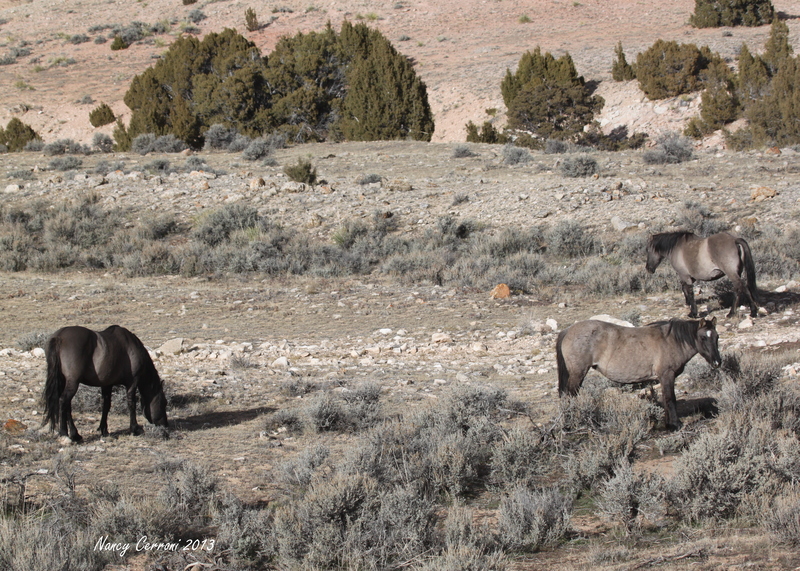 It didn’t take long at all to drive into the Range and see the three of them standing in one of their favored spots just north of the highway. I have been experimenting with my camera a bit, and unfortunately didn’t get many decent pictures of the three of them. But we can rest assured that the three of them are safe. 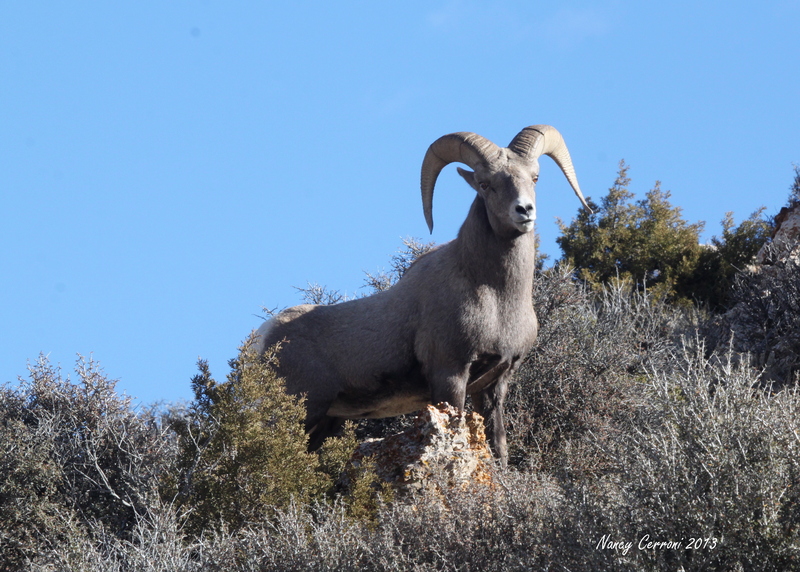 Just as we approached the turnoff to Devil’s Canyon we had a wonderful opportunity to see a pair of Big Horn Sheep. 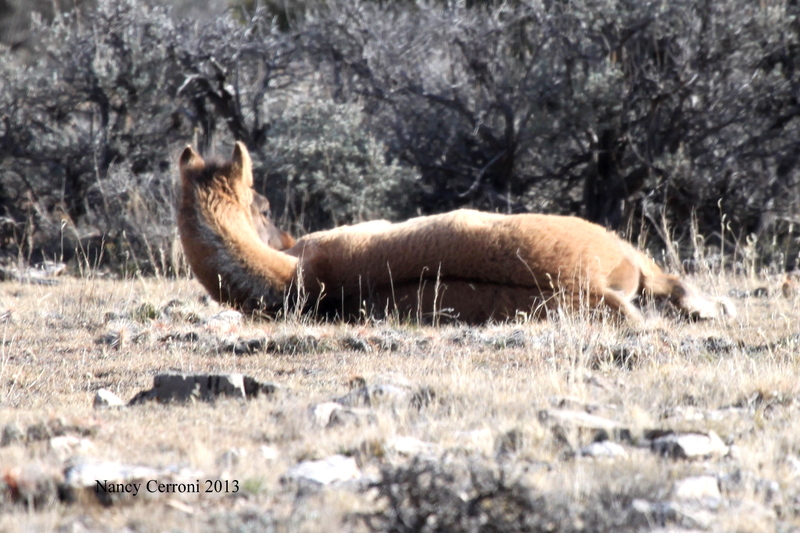 It is really a treat to see Big Horns. 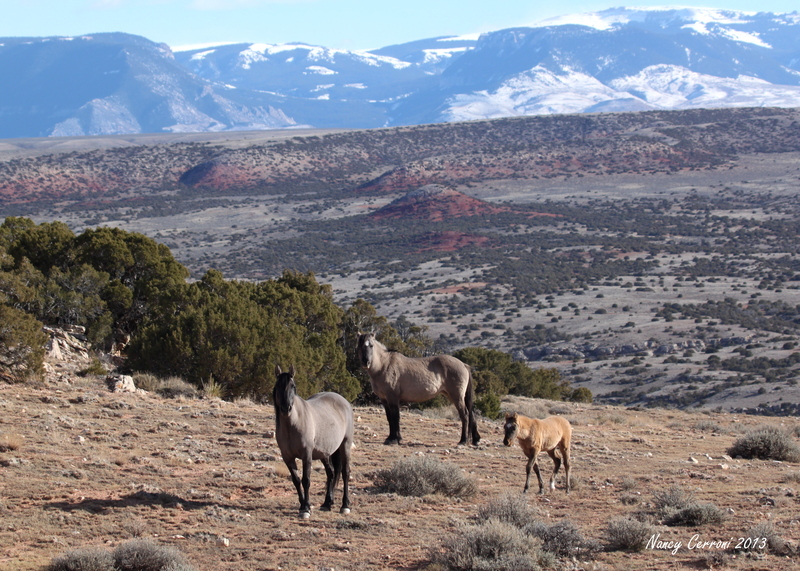 The trip continued through the winding road between the Overlook and Mustang Flats. 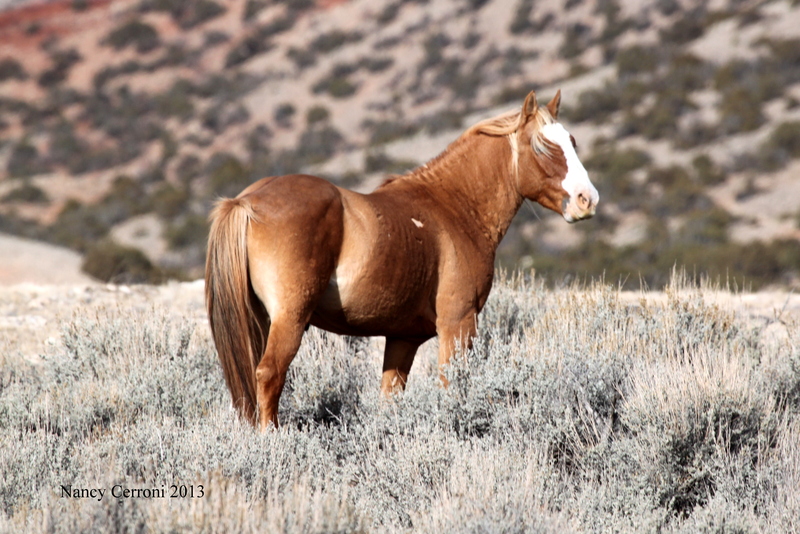 Just as we were heading up the hill before the Flats, we came upon Blizzard and his band moving in the same direction. Even though I had spent time with them yesterday, it was very special seeing the young one again today. A bicycle rider was heading up the highway at this time. 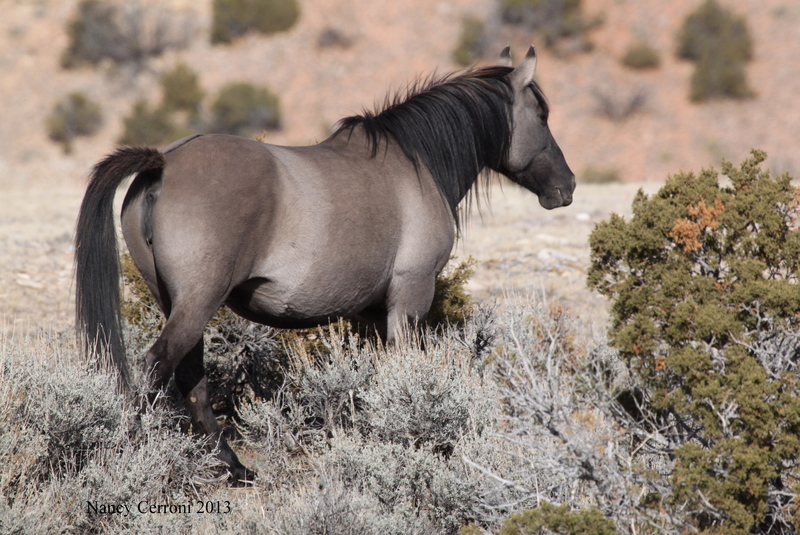 This caught the attention of the horses and gave us a good glimpse of the “flight” mechanism of the wild horses when danger is present…real or perceived. Bakken quickly took La Niña up the hill. 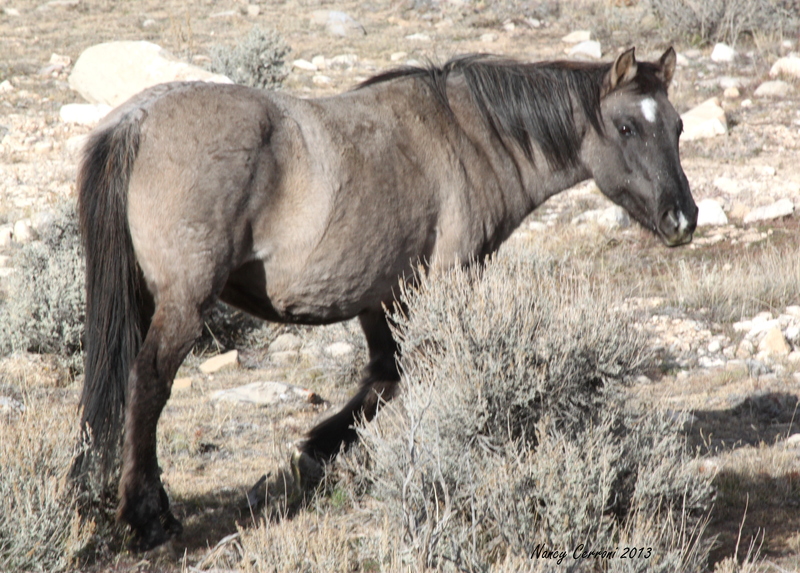 At the top of the hill, she paused and seemed to check out the situation. 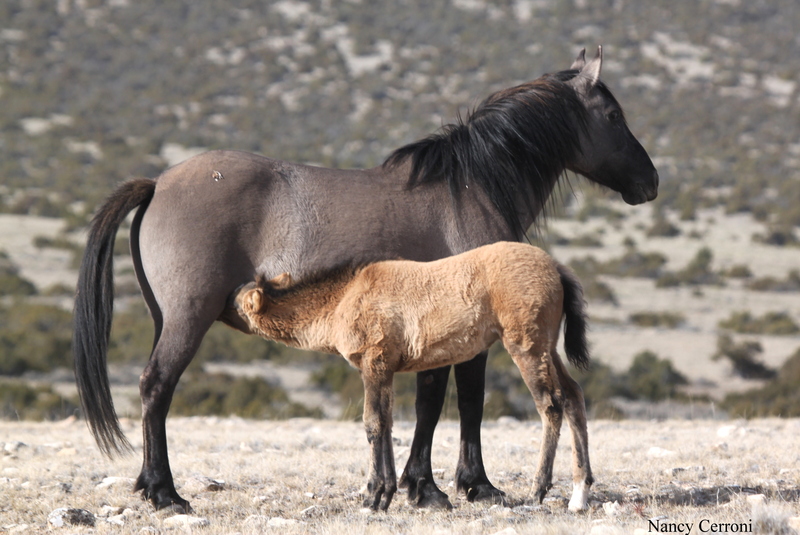 She positioned herself between the foal the the bicyclist. Note how her eyes and ears stay fixed on her surroundings. The mares and the fillies disappeared into the next draw. Blizzard followed behind and stayed alert as if to ensure safety for the band. We left Blizzard and continued to the Mustang Flats kiosk. 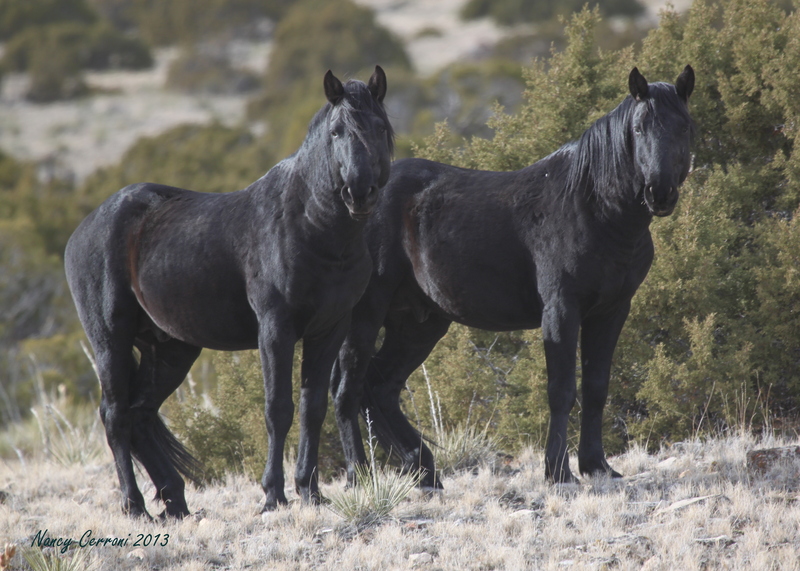 The familiar black horses were spotted in the same vicinity of yesterday. A nice hike brought us to the band of brothers. Seattle definitely has a strong legacy on the Dryhead with these four. Issaquah and Chief Joseph were resting side by side near a juniper bush. They show a nearly identical resting pattern. Issaquah and Chief Joseph are both the offspring of Bakken. Johnston and Hawk were a short distance from their brothers. These two are the offspring of Cascade. 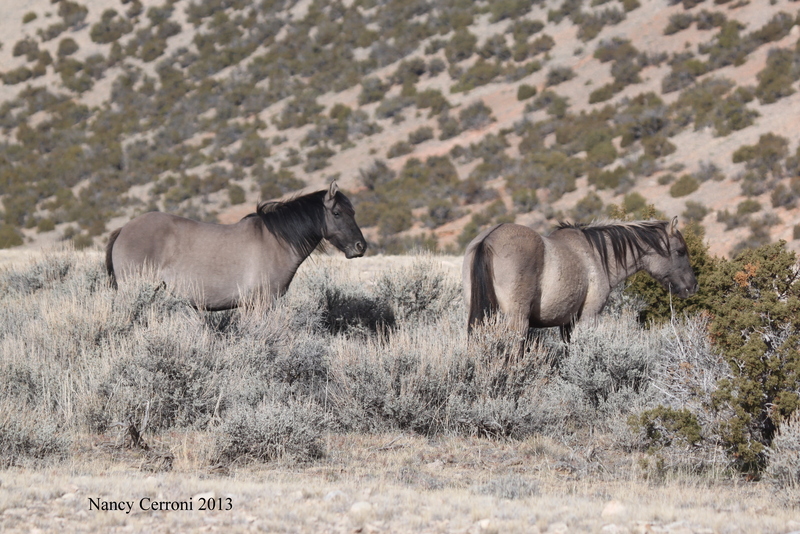 They both had a curiosity about us and provided some good opportunities for photos. 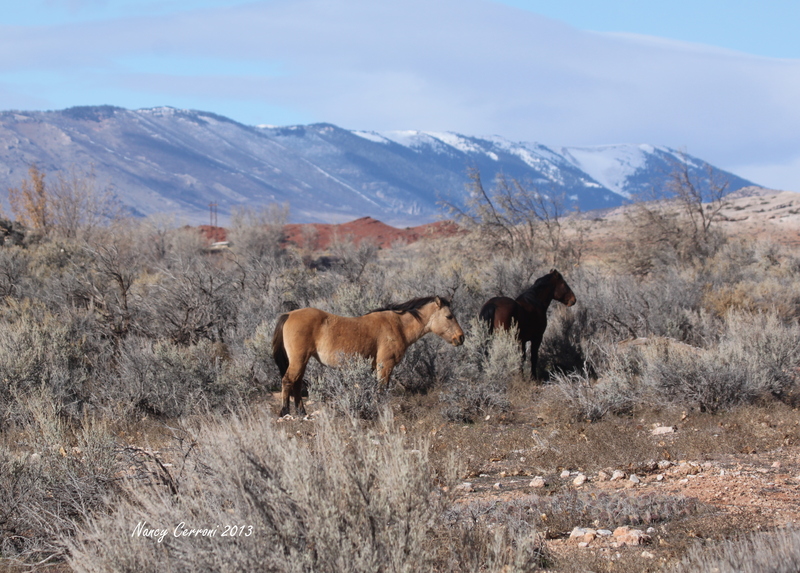 The day’s journey continued…a short distance down the road brought us to Fiero and his mares. Sacajawea noticed something to the west of the band. 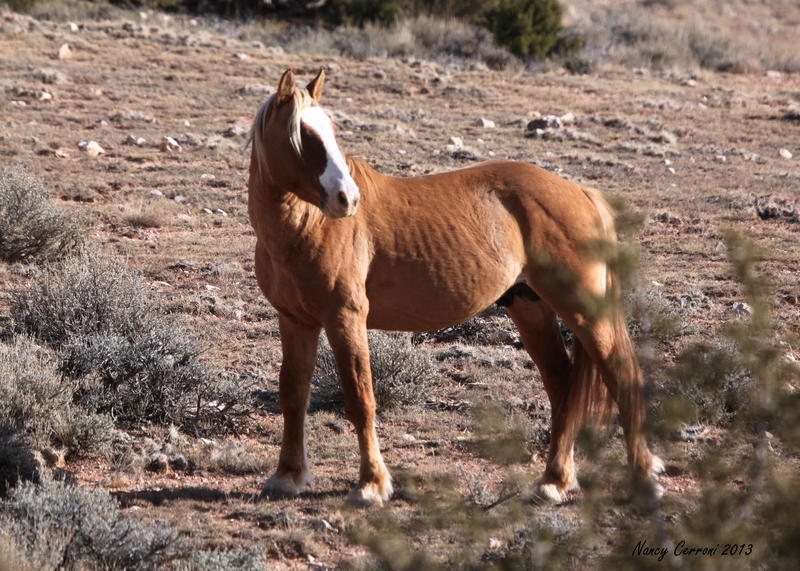 She is an alert mare and doesn’t miss much. Off to our left we found out what had caught Sacajawea’s attention. 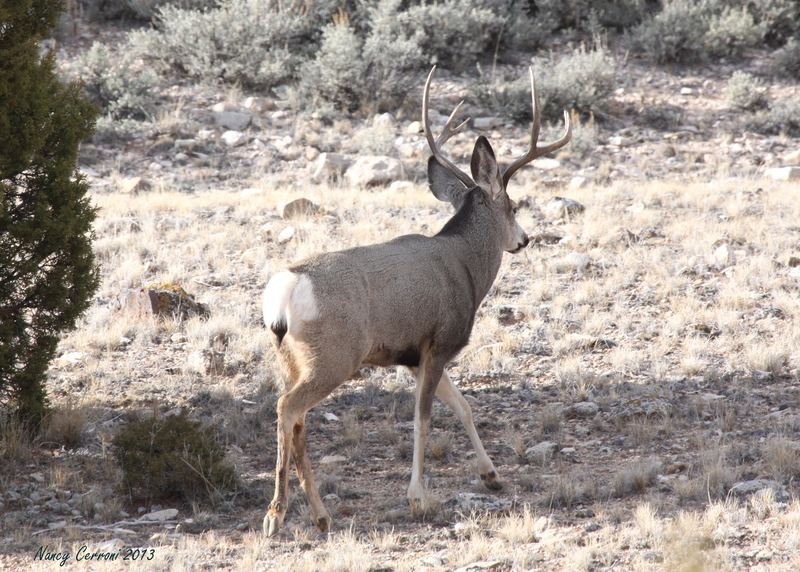 A beautiful mule deer buck emerged from the nearby juniper bushes. The day in the Dryhead was coming to an end. 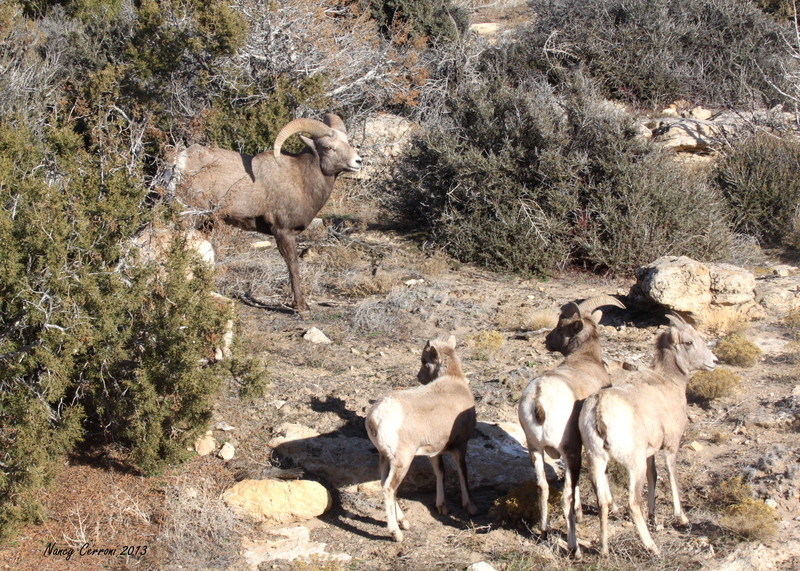 But as we neared the State Line we had a bonus of seeing a band of Big Horn Sheep near the side of the road. This could be the same ram we had seen earlier in the day. Now there were several ewes and lambs with him. 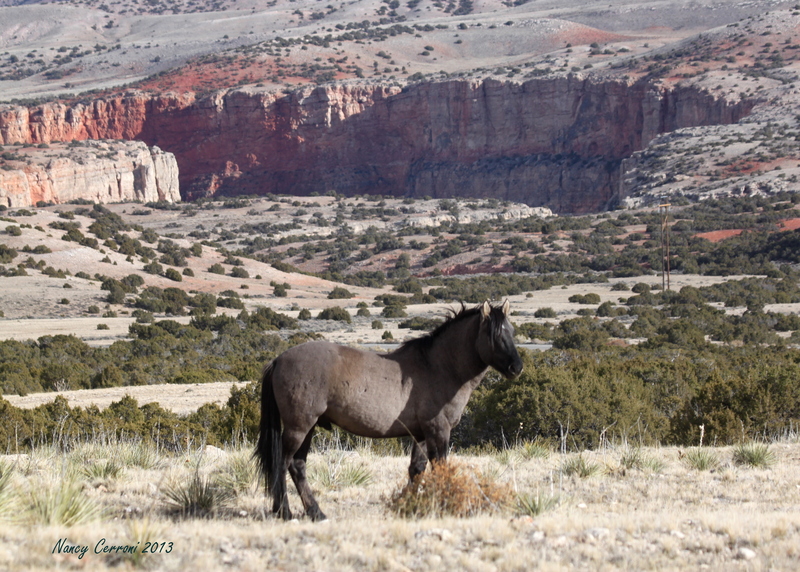 A very special day…filled with the beauty of the land and the animals that live there. Every trip to the Dryhead is an adventure. Today was certainly true. The day was a little bit overcast and cool. The trees were noticeably bare, their limbs a tangle of silhouettes against the red rocks around Crooked Creek Bay. 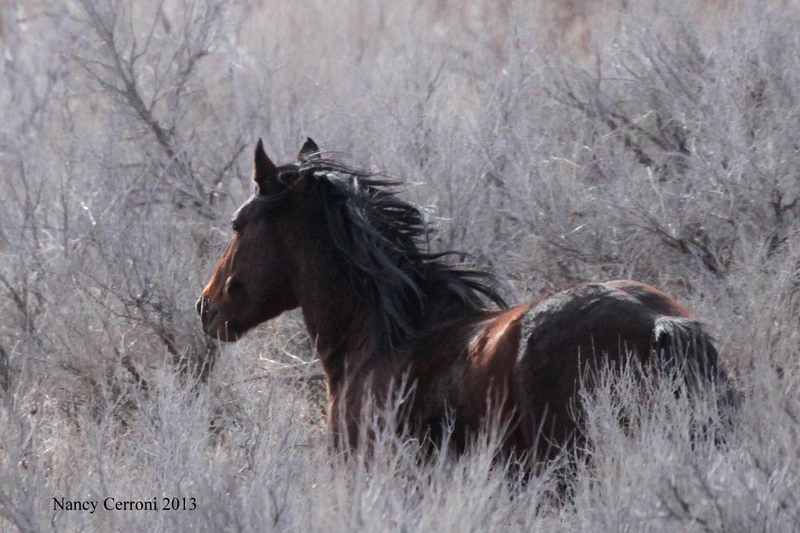 As many times as I come up here, there is always a sense of excitement about what horses will be seen. But on a day like today, the chance to get out and hike in the beauty of that country is adventure in itself. I was determined to find La Niña. 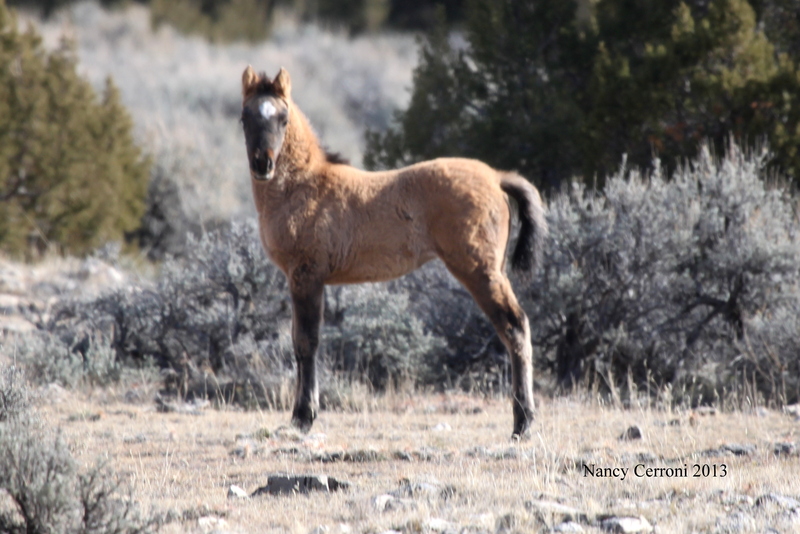 Last week Diane reported that Bakken and her foal were with Fiero, Strawberry, and Sacajawea. 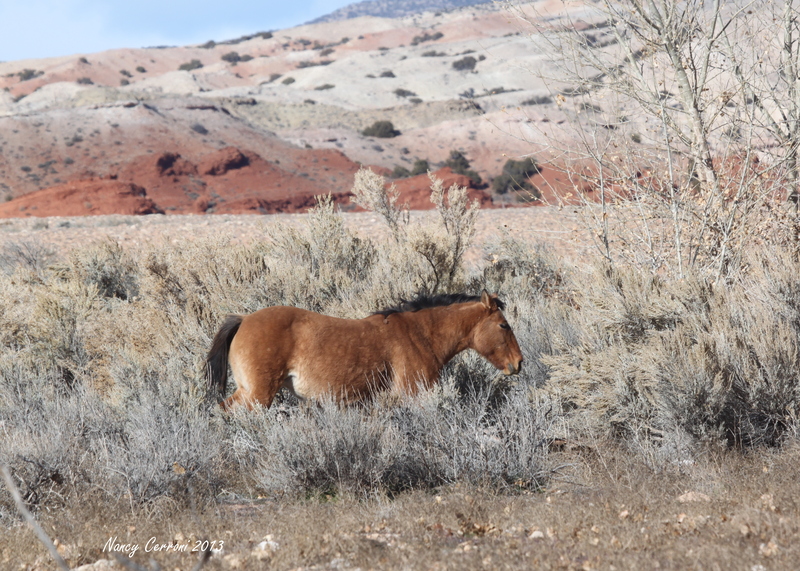 I set off to find her along the meadows of Layout Creek. No luck! So off I went back to my Jeep. 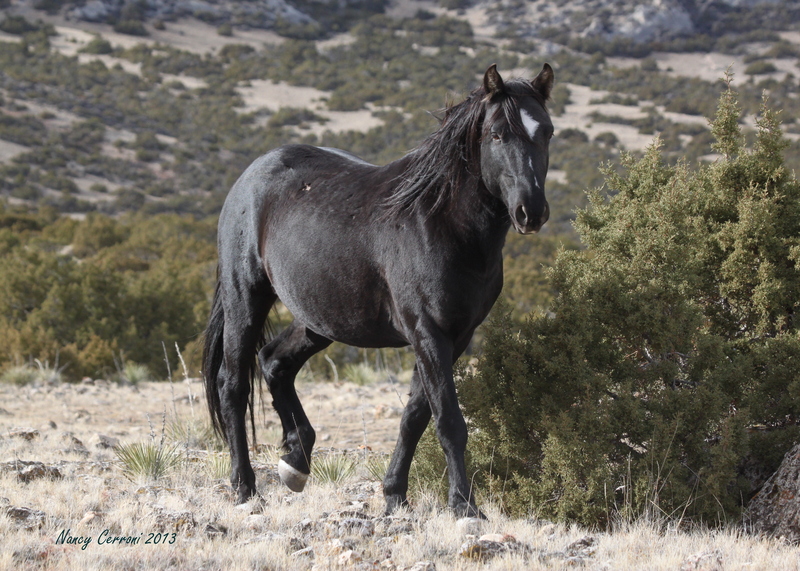 I had seen three black horses up in the foothills of the Pryors so that was my next adventure. I pulled off the highway to park near the power lines. Something caught my eye just off the road. The flash of gold had to be Blizzard. Grazing nearby were Cascade and, yes, Bakken was back with Blizzard. I watched for awhile as they started moving west. But where was the foal? Blizzard grazes with mares Cascade and Bakken. Another flash of gold had the answer. La Niña was laying quite a distance from the family. She raised her head as she heard me draw nearer. And in a quick moment she was up. She began her own little adventure. She was unable to see her family which caused a bit of a panic. 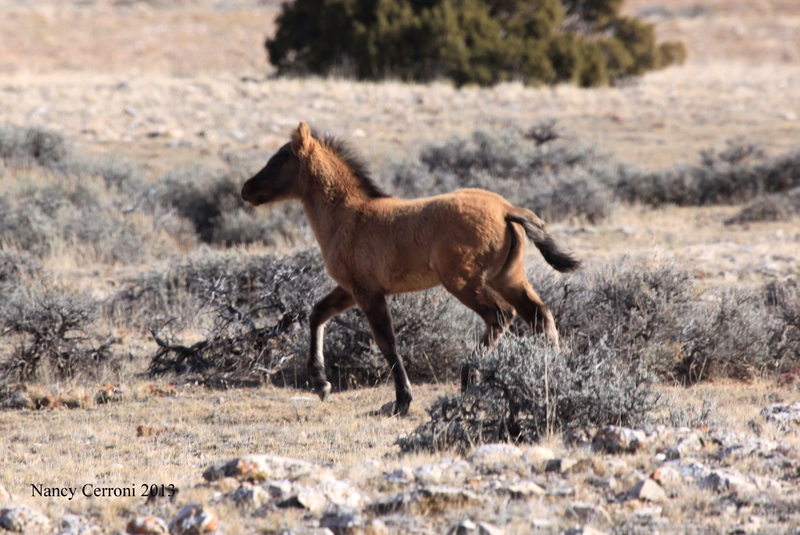 With a high pitched whinny she took off at a run. The adults in the band watched the action, but made no attempt to call La Niña back to them. Blizzard watches as La Niña runs in search of the family. 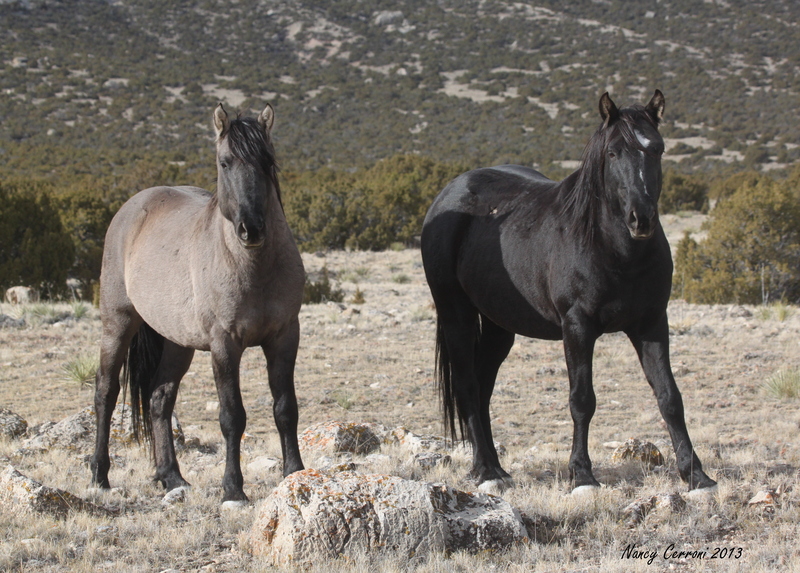 Bakken and Cascade keep an eye on the foal’s actions. 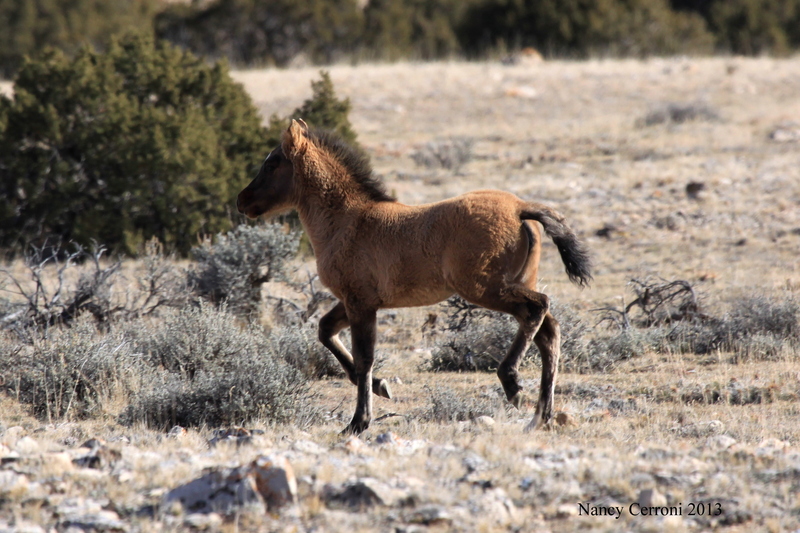 The foal was running north, but Bakken wasn’t going to let her get too far away. 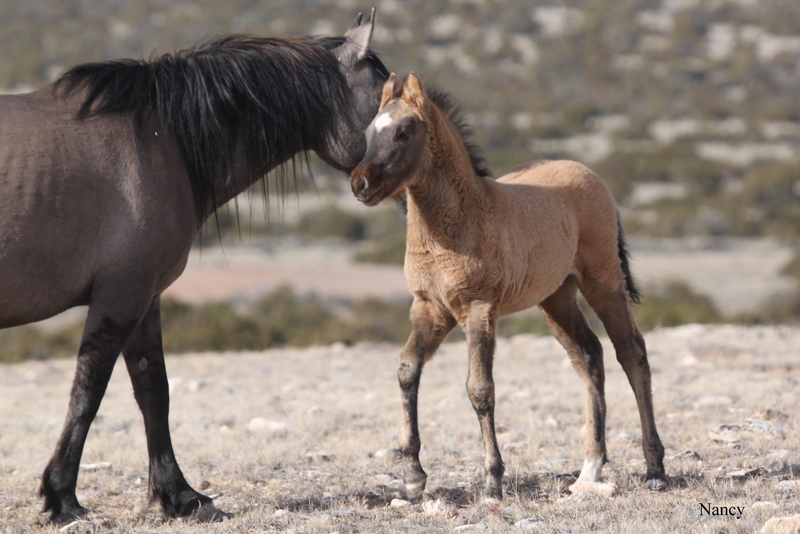 With a very muted whinny, Bakken called to the foal. Bakken whinnies for La Niña. Success! La Niña is reunited with her mom. La Niña comes up from the ravine and finds her mom waiting. 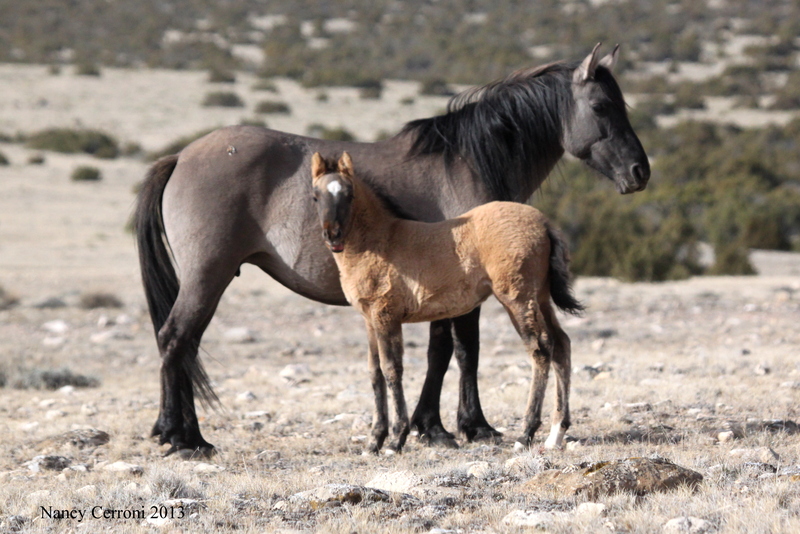 La Niña’s face is very dark and may indicate grulla. Time will tell. Blizzard got the band moving to the north. 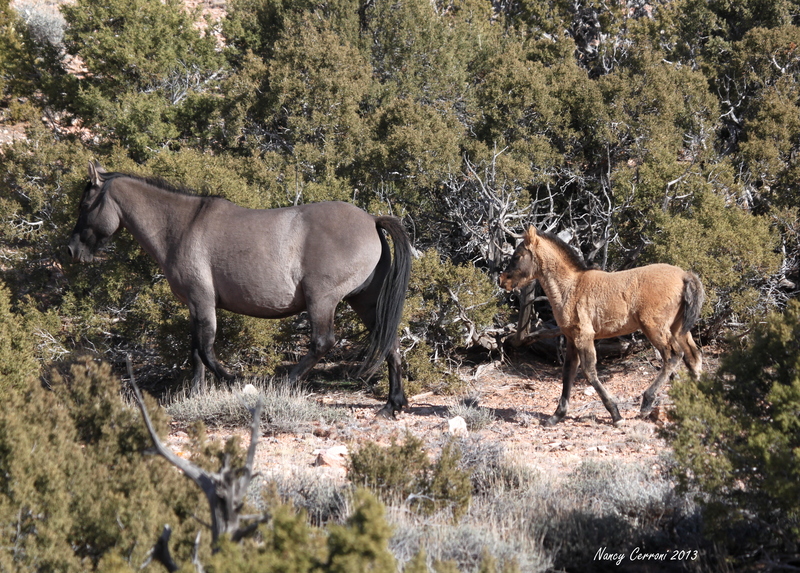 The mares and foal followed behind. 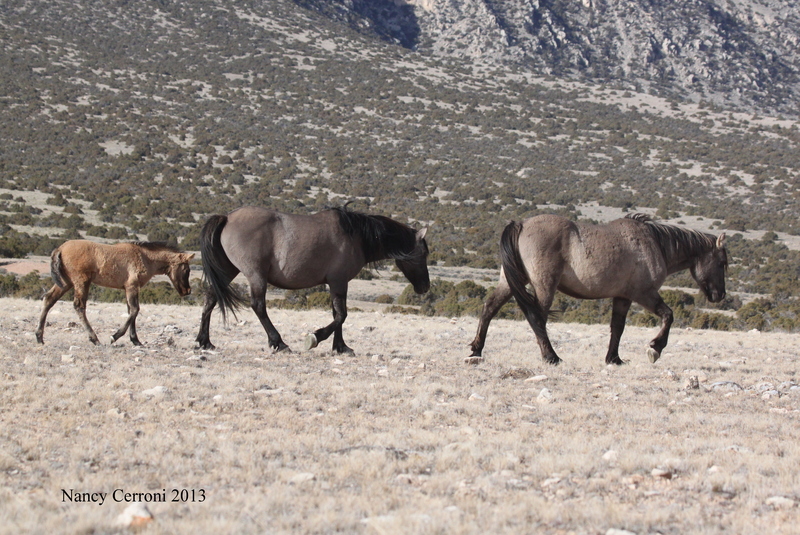 I searched the hills to the west to see if I could spot the three black horses. Unfortunately I was unable to find them so I decided to head home. 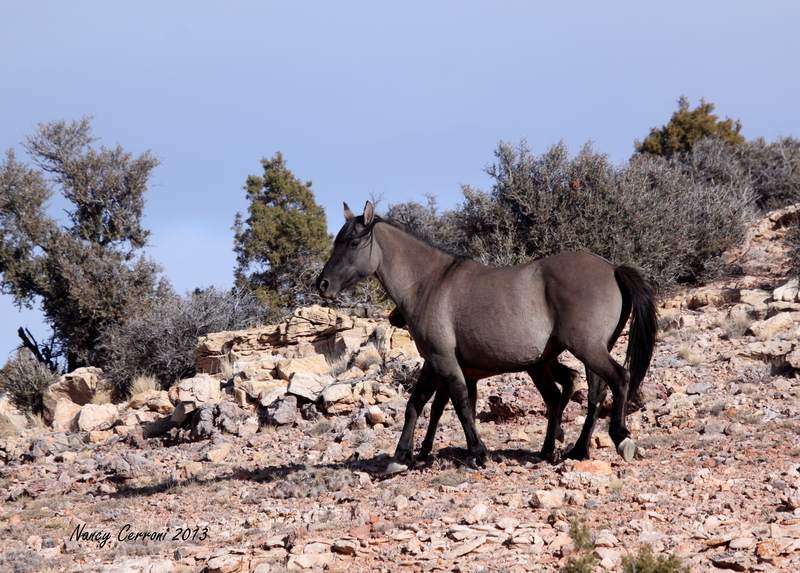 As I neared Crooked Creek Bay I came onto my next adventure…this one with Hickok. A group of three young whitetail deer came bounding out of the brush near the road. A noise came from the brush behind the deer. And it was Hickok. 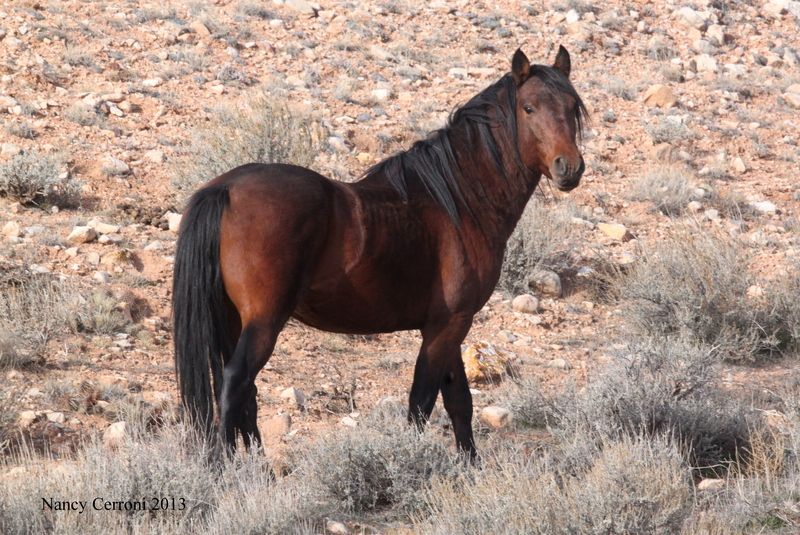 He was agitated and obviously looking for the mares, Seneca and Hightail. 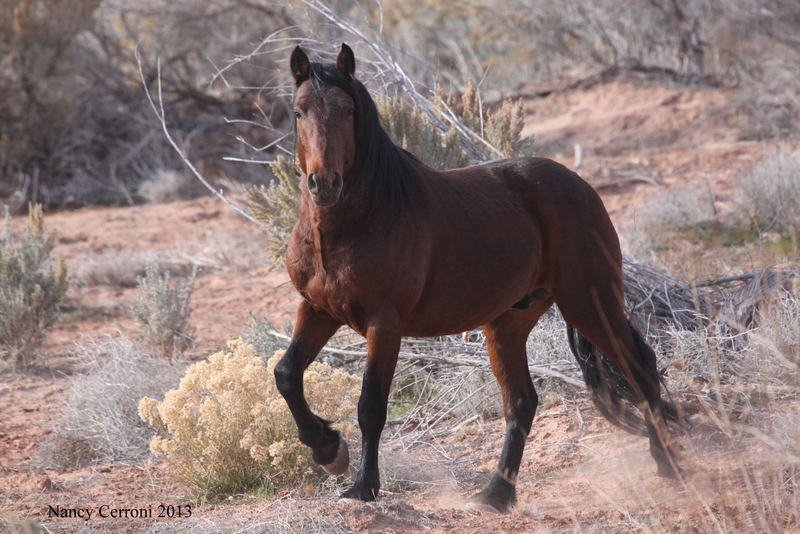 He took off across the highway and down into the thick brush. Hickok runs through the brush. 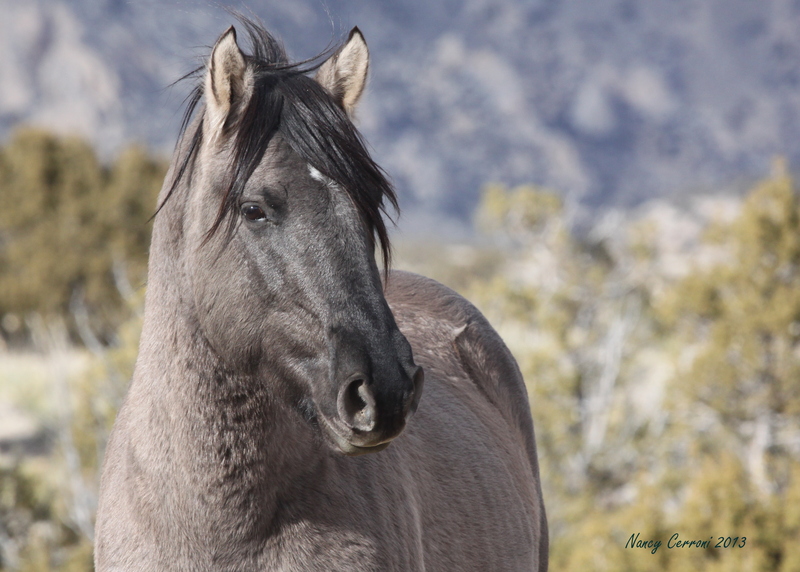 He called repeatedly to get the attention of the mares. 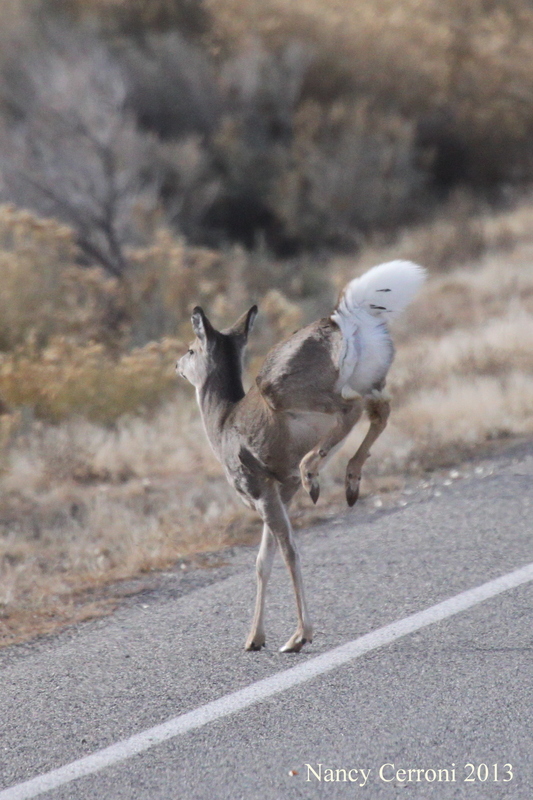 He quickly ran around the area south of the highway and crossed back to the north side of the road. 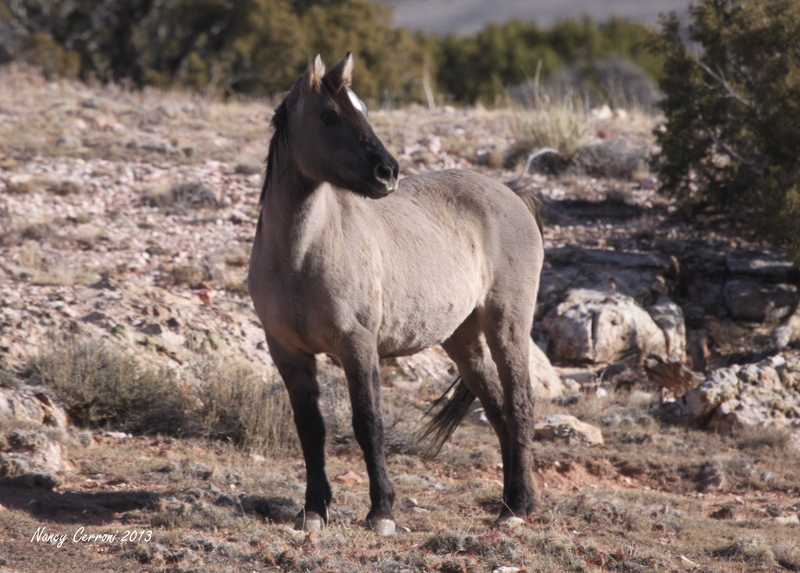 Hickok whinnies loudly for the mares. If you look closely you can see swelling on the left side of his face. I followed as he walked on a trail leading to the north. Every so often he would stop and look around. 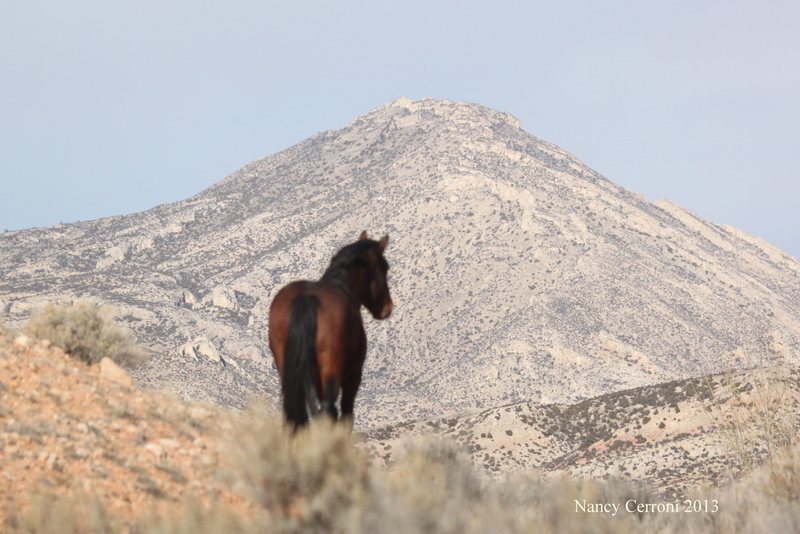 He went up a slope and used the vantage point to try to find the mares. 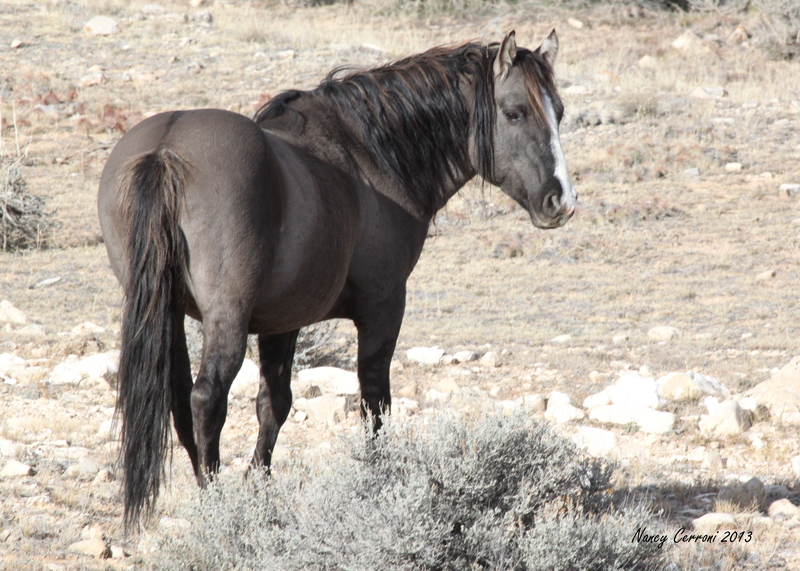 He looked magnificent against the background of Sykes Ridge. And then he took off at a quick lope, no way possible for me to keep up. I returned to my Jeep and went back up the road. 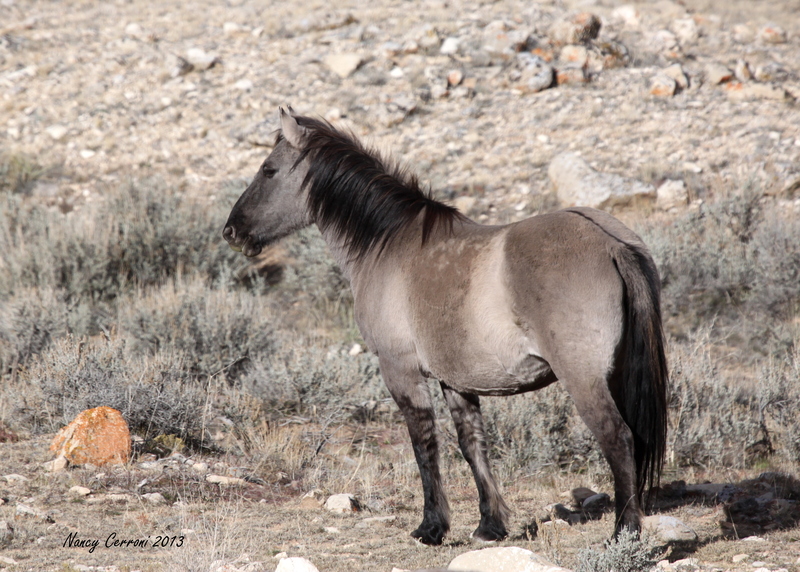 He was over by the boundary fence still pacing and calling out for the mares. 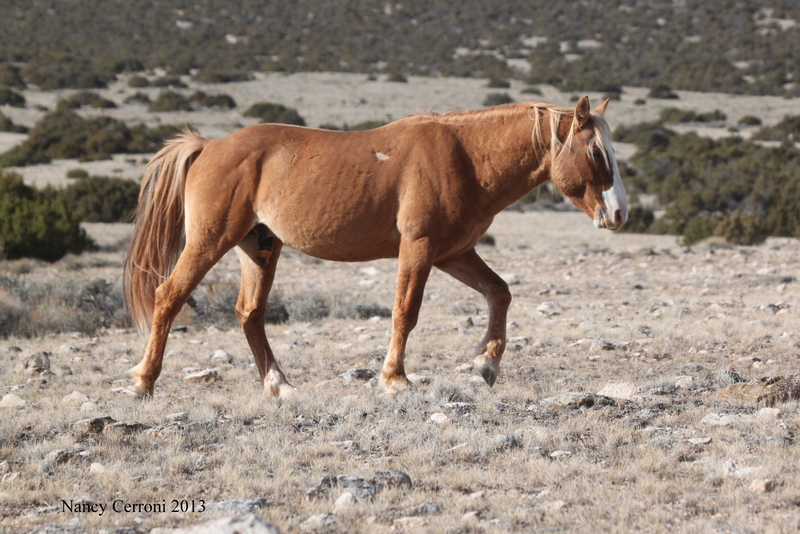 I left the Range, not knowing where Seneca and Hightail are. They have been known to take off together on their own adventures. 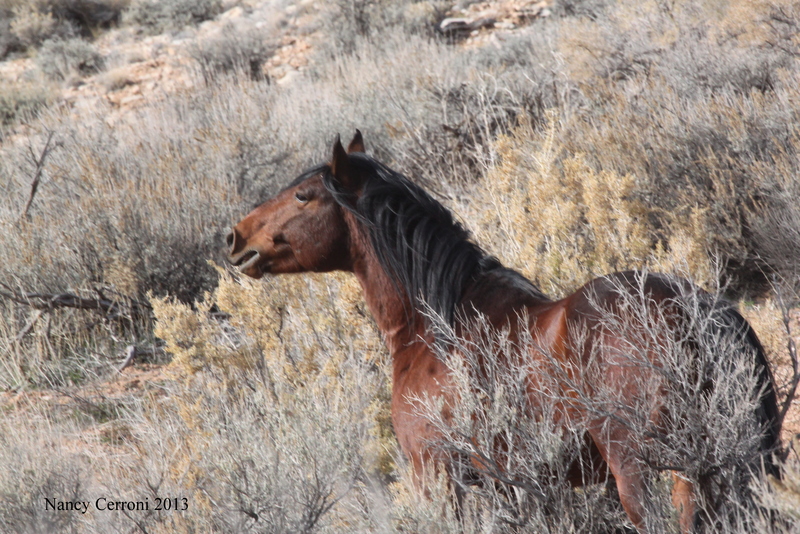 I’ll try to get up there again tomorrow to see if Hickok was able to meet up with the mares.